During the summer, I try to incorporate more fruit into my diet. Not for health reasons, but because when it’s fresh and “in-season”, it’s friggin delicious. So when FreshDirect reached out with this promo, I was stoked to try the seasonal ingredients in a recipe. This is the first one I came up with, and I am pretty happy with it. First let me say that this was a generous amount of produce, and the first thing that came to mind was to make jam with the strawberries. Why? Because these strawberries were probably the best strawberries I’ve ever had. They were so deep in red color and they were SO SWEET AND JUICY HOLY MOLY I COULD JUST EAT THEM RIGHT OUT OF THE BIN. But I said I would cook with them, so, cook I did. 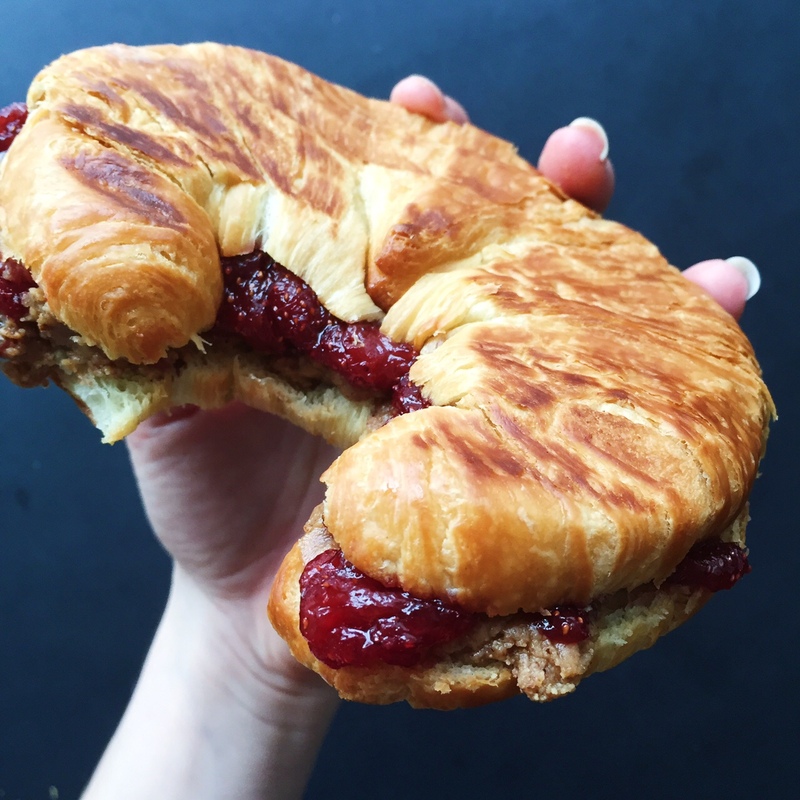 I made jam from scratch along with some maple bacon almond butter, put it on a croissant and grilled it for the best variation on PB&J you’ve ever had. Fun fact: I used to hate fruit when I was a kid. I would eat veggies for days but shunned fruit…not sure why. Note: You could easily make this with Peanut Butter. I actually did that the first time with smooth PB and added roasted peanuts to make it chunky. Or you could cut out the middle man and just buy chunky. I’m also doing a giveaway for you fine readers! All you have to do is Like me AND FreshDirect on Facebook and/or follow on Twitter, and I will select a person at random to win a $50 FreshDirect gift card! EXCITING! 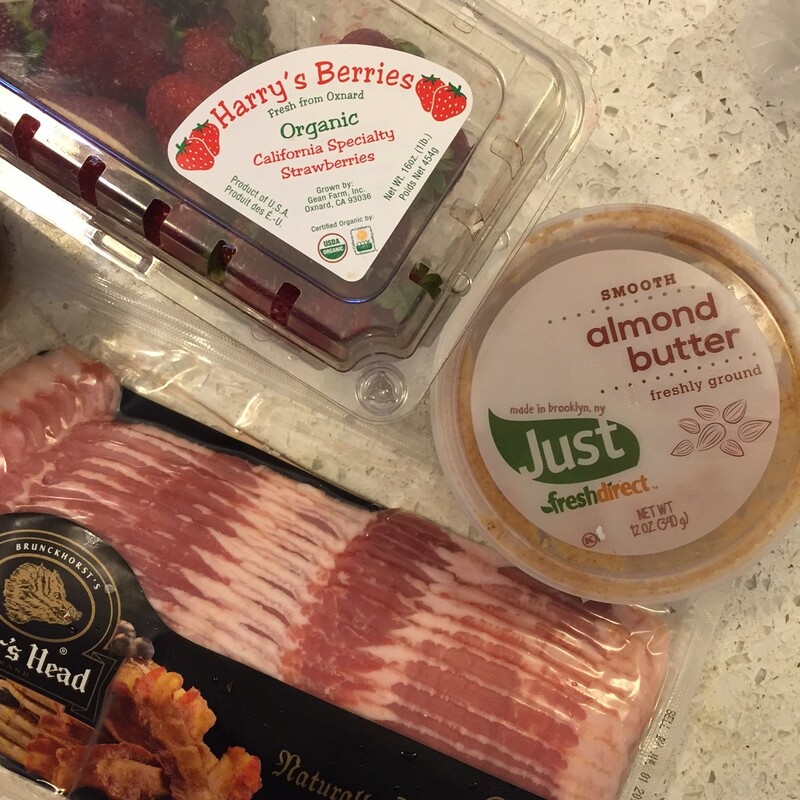 I use FreshDirect all the time and aside from good produce, their bacon is fantastic. I used Boars Head here but 90% of the time my bacon comes from FreshDirect. No joke. Also I used FreshDirect almond butter because it’s my favorite and always in my fridge. 1. 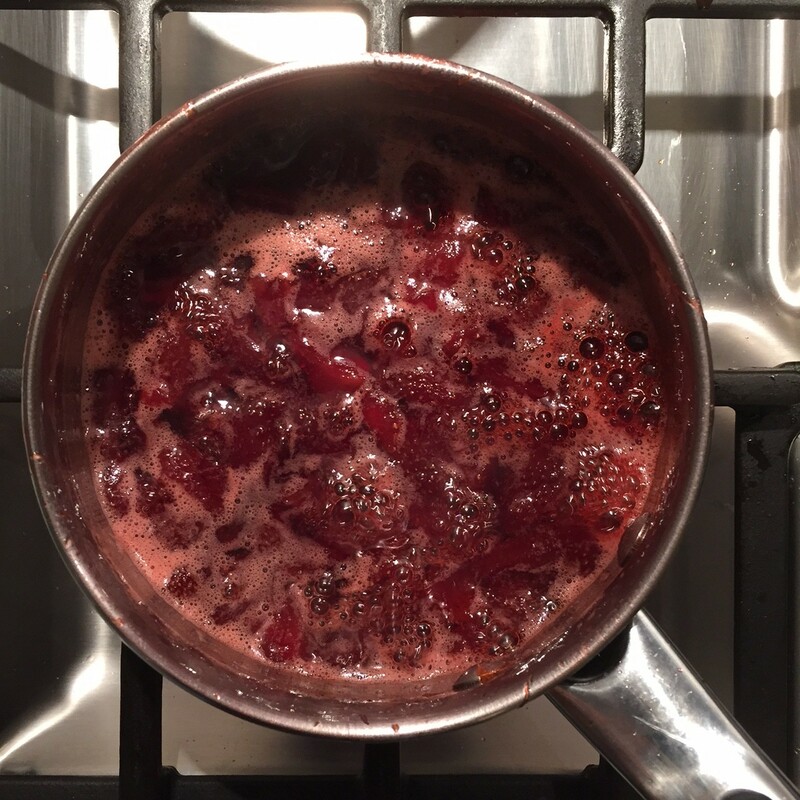 Make the strawberry jam. Bring the sugar, lemon zest, lemon juice, and water to a boil. 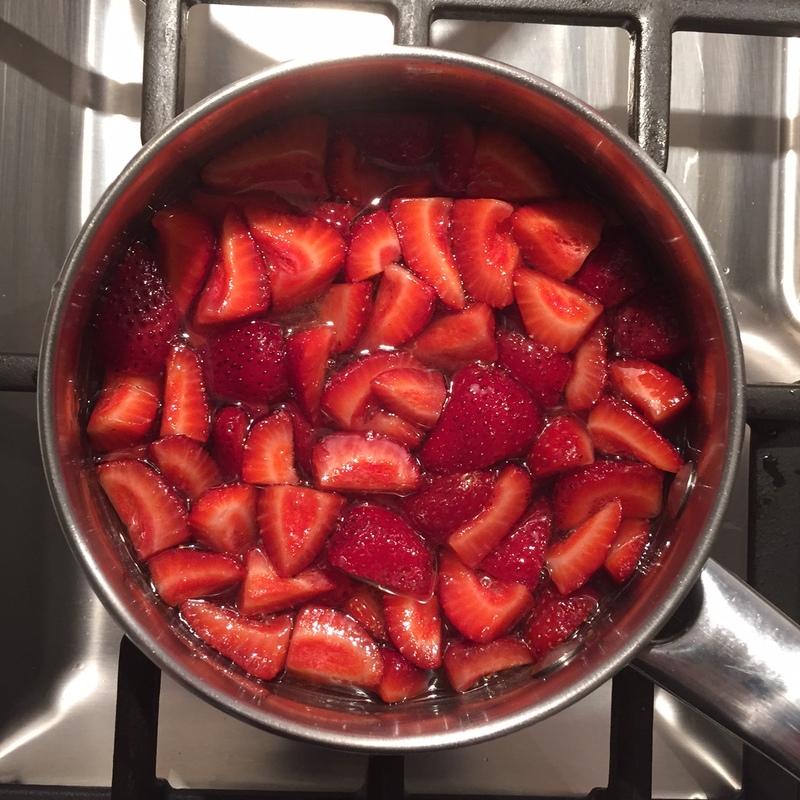 Add strawberries and stir slightly to incorporate. Lower heat to medium and let simmer for 15-20 mins. KEEP AN EYE ON IT. It WILL bubble up and possibly spill over the sides. This happened to me. And it solidifies to your stovetop because it’s sugar and it’s a pain to clean. Not impossible, but a pain. 2. 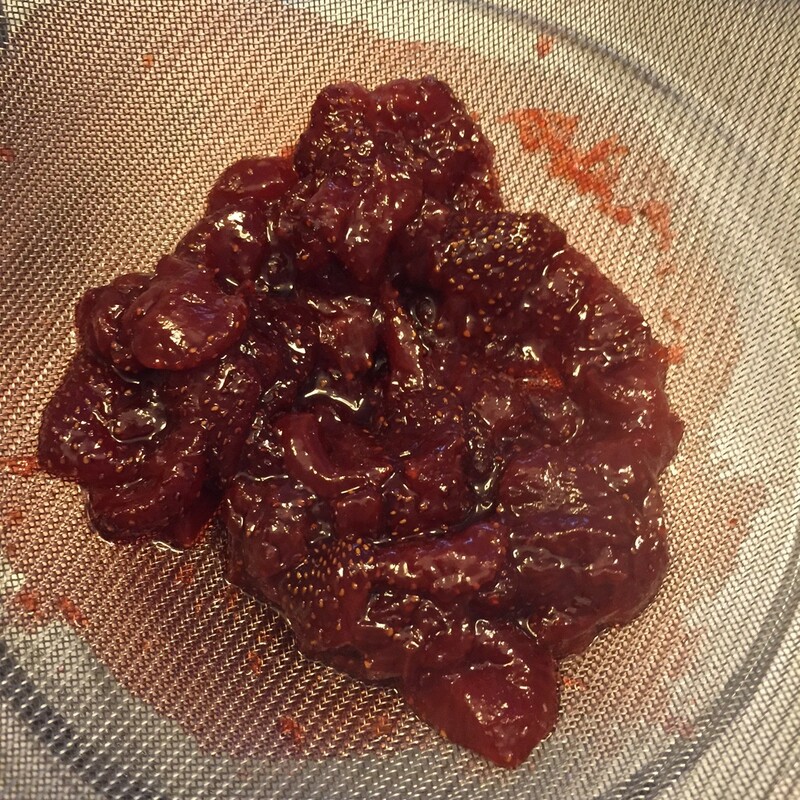 When the strawberry mixture has reduced and looks thick and has a gel-like consistency, shut off the heat and let cool for a few minutes. 3. 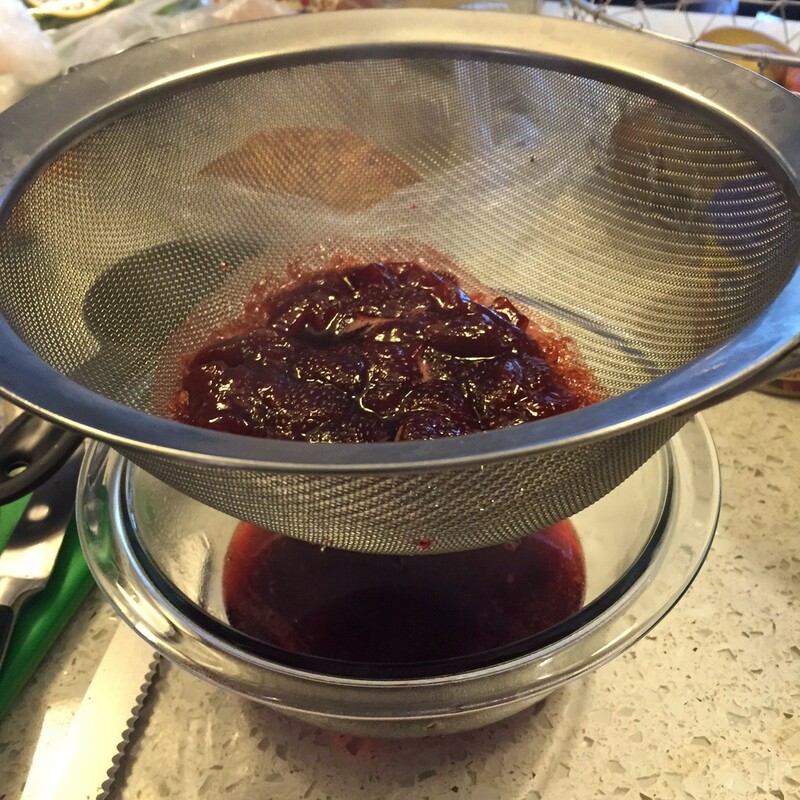 Place a mesh strainer over a bowl and strain the berries so the juice/syrup will fall into the bowl and you’re left with beautiful berry jam! 4. 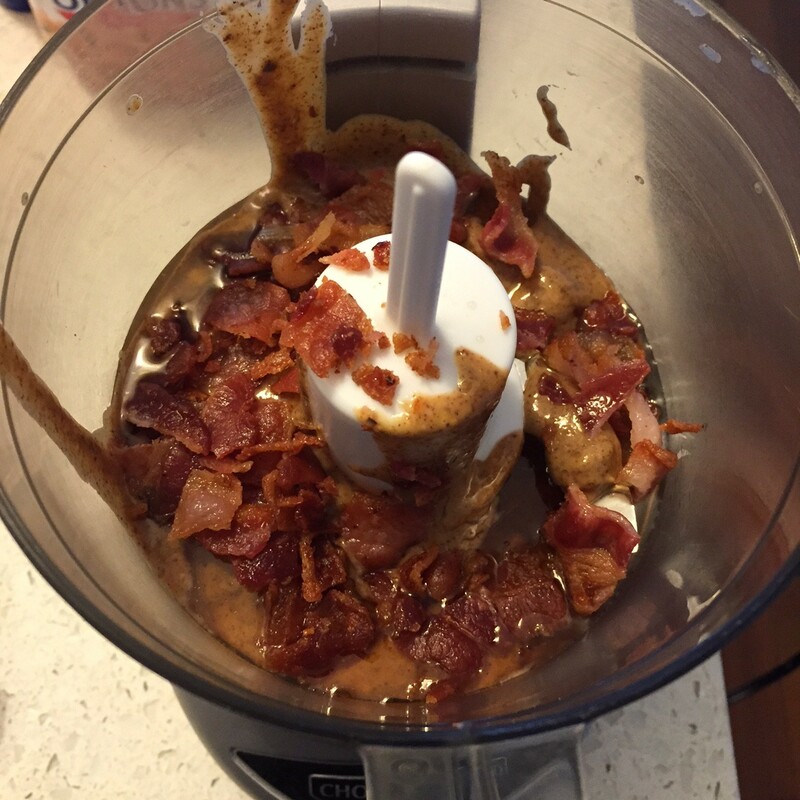 Make the maple bacon almond butter. 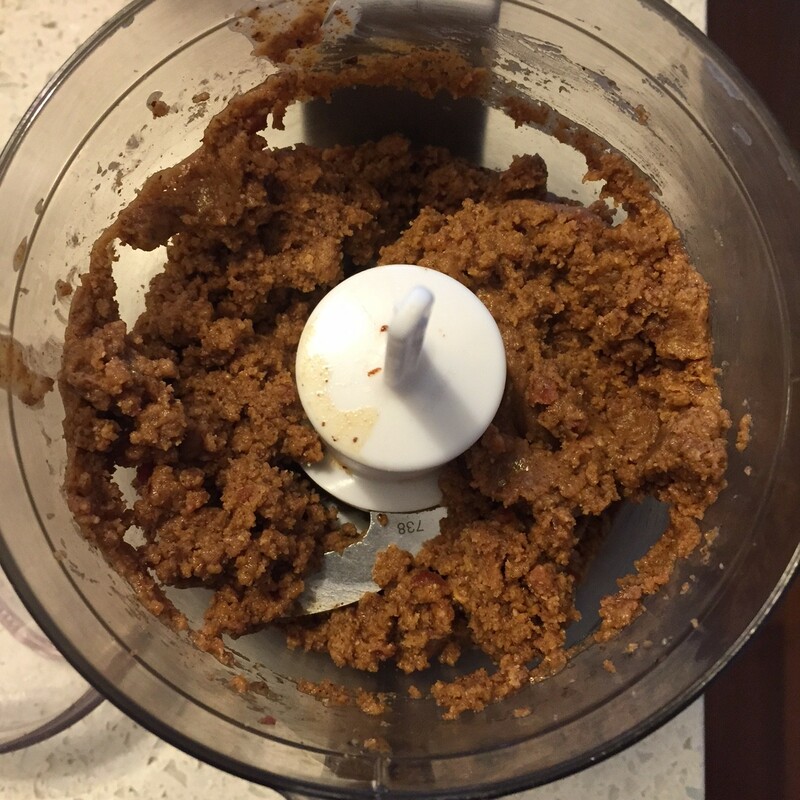 Put almond butter, maple syrup and bacon into the food processor and blend together. It will be pasty and thick, but it will be good. Don’t be shocked if the consistency is not like peanut butter. 5. Make the sandwich! 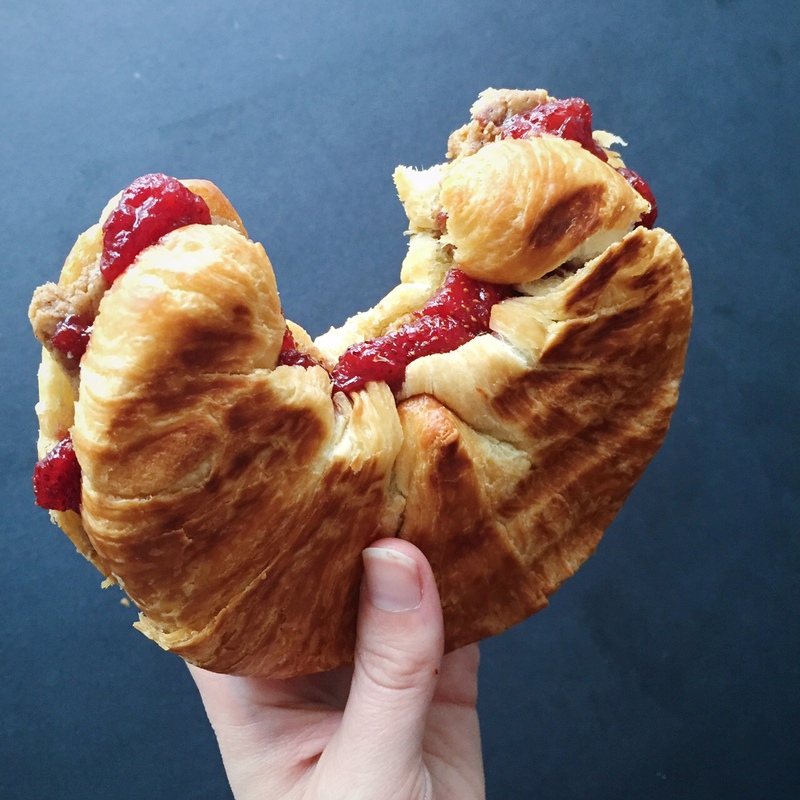 Assemble a nice hefty layer of almond butter on one half of the croissant. Spread jam on top. 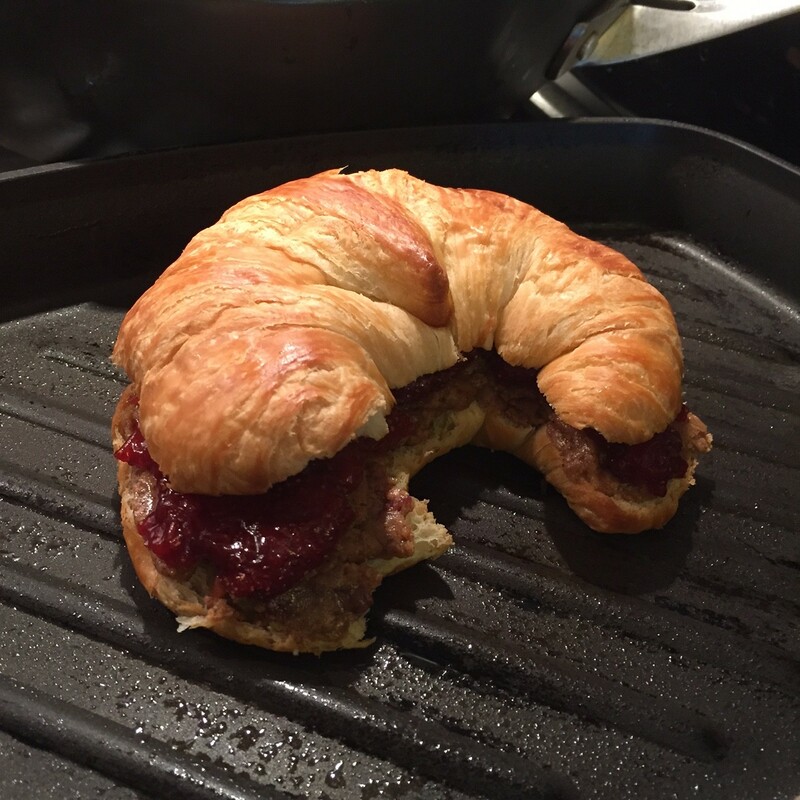 Close the croissant and throw that beast onto a hot grill pan or griddle. Press down to flatten a bit and warm it all up. 1. 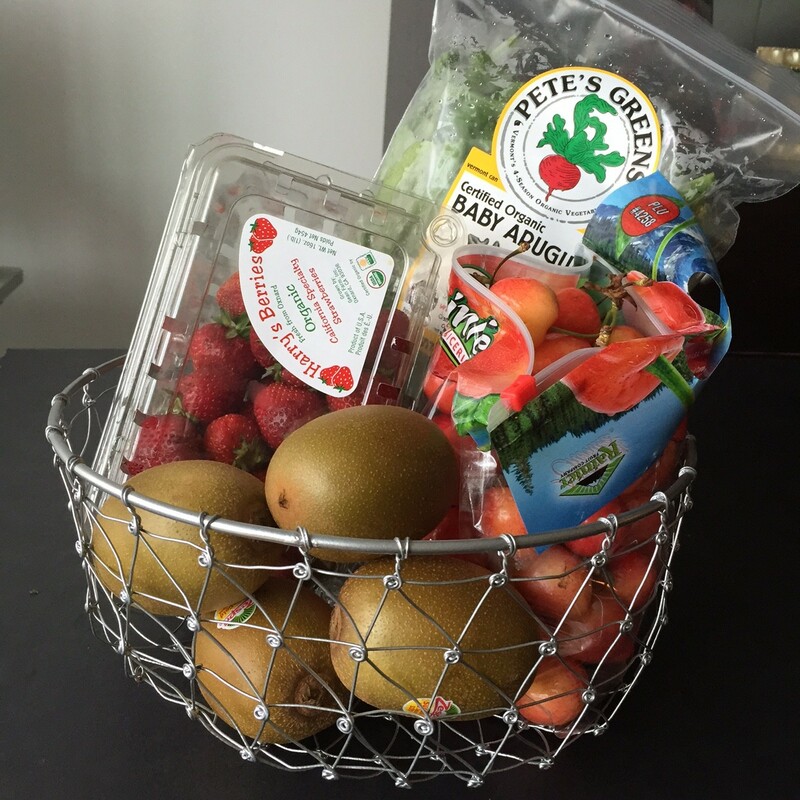 Like/follow me AND FreshDirect on Facebook/Twitter (pick one if you don’t want to do both…but how hard is it REALLY?) and you’ll be automatically entered. 2. I will select a winner at random next week before July 4th. 3. If you already are a fan of both of us (GOOD FOR YOU! ), just comment on this post or on my #FDProducePics Instagram posts. I will count those as entries as well!